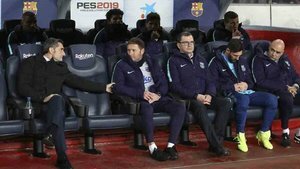 Barcelona coach Ernesto Valverde says he left Lionel Messi on the bench against Real Madrid because it was the best decision for the team and the player. Messi injured his thigh against Valencia on Saturday and wasn't risked from the start in the Copa del Rey semifinal first leg. Valverde brought him on for half an hour. "Messi is OK but we preferred to not take any risks given the stage of the season we're at," Valverde said. "The decision is taken based what I think is best for team and for the player. He ended the other day with a small problem but he felt fine today. "We thought that it was best to bring him on in the second half. When he came on could have been decisive. Every time he gets on the ball we know what it does to the opposition." But Valverde suggested he was not 100 percent fit when asked if Messi will start in La Liga on Sunday at Athletic Bilbao. "I don't know," he added. "I hope so. If he's fit, he will start."